What Would Happen If You Died Tomorrow? Would your family need to make substantial financial sacrifices and give up the lifestyle to which they’ve become accustomed in order to meet their financial obligations (e.g., car payments, mortgage, college tuition)? These questions are not intended to scare you, though they might. 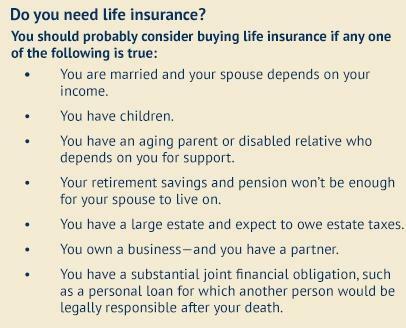 For those who are of working age and who have spouses and children, the possibility of dying leads many to consider buying a life insurance policy. The proceeds from an insurance policy can help your loved ones continue to manage financially during the difficult weeks, months, and years after your death. The proceeds can also be used to meet funeral and other final expenses, which can run into thousands of dollars. Once you purchase a life insurance policy, periodically review your coverage—especially when you have a major life event (e.g., birth of a child, death of a family member)—and be sure it adequately meets your insurance needs. The most common mistake that people make is to be underinsured. For example, if a portion of your life insurance proceeds are to be earmarked for your child’s college education, the more children you have, the more life insurance you’ll need. But it’s also possible to be over-insured, and that’s a mistake, too—the extra money you spend on premiums could be used for other things.